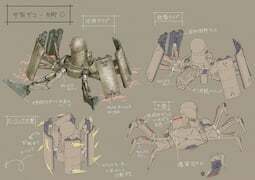 Multi-leg Medium Model is an Standard Machine enemy in NieR: Automata. 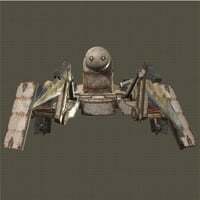 "A medium-sized machine lifeform that has multiple legs, much like an insect. By emitting energy from the tips of its legs, it can move about as though gliding across the ground. There exist long-range types equipped with firearms and close-range types equipped with cutting arms." 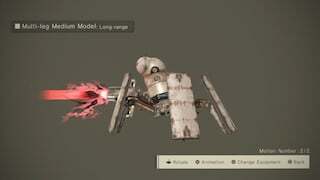 Where on earth do you find these on chapter select? Either I can&apos;t leave my mission to go to the factory or the elevator is red. You can farm these left (or back into the factory&apos;s underground) from the Factory: Furnace transporter. You&apos;ll find them on the walls in the 2D gameplay section. From the Factory: Hangar access point, you&apos;ll also find 2 or 3 of these in the first round building (past conveyor belt with press machines). Easy Sturdy Sockets if you have max drop rate. 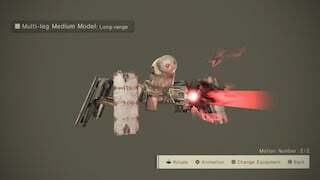 Do some know where to find the long range enhanced one ? Never tried editing a wiki so i&apos;ll refrain from trying but, these enemies can also drop Sturdy sockets.